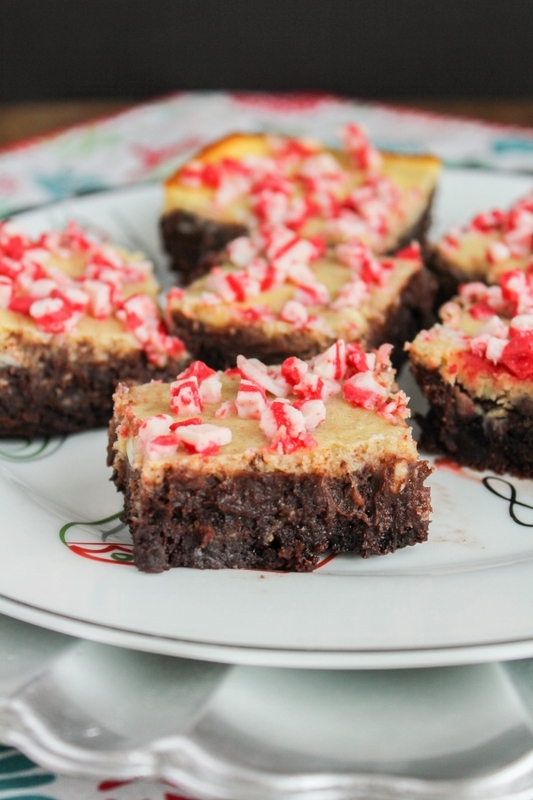 peppermint pieces, and you've got one delicious, decadent, and fun holiday dessert! You know me, I absolutely love to bake this time of year. I mean I love baking all of the time, but it's extra special during the holidays. From Christmas cookies to fancy cakes and everything else in between, I love creating desserts to share with my family and friends. 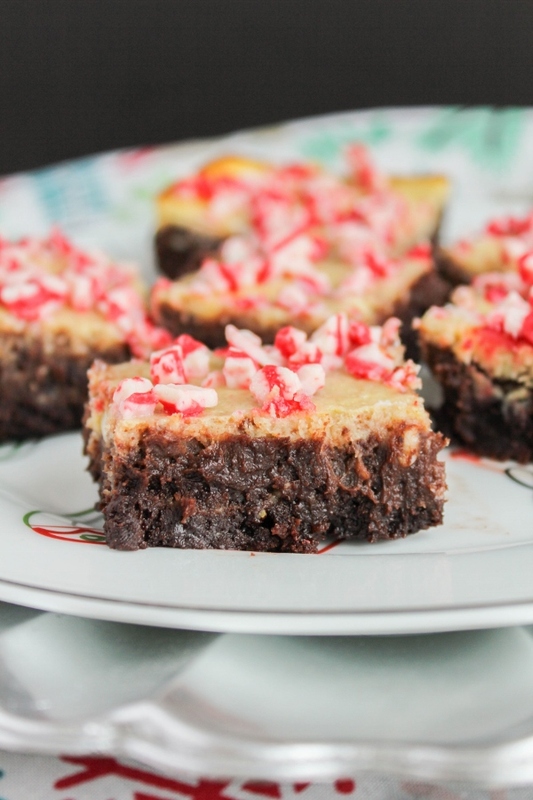 These Peppermint Cheesecake Brownies are definitely no exception. 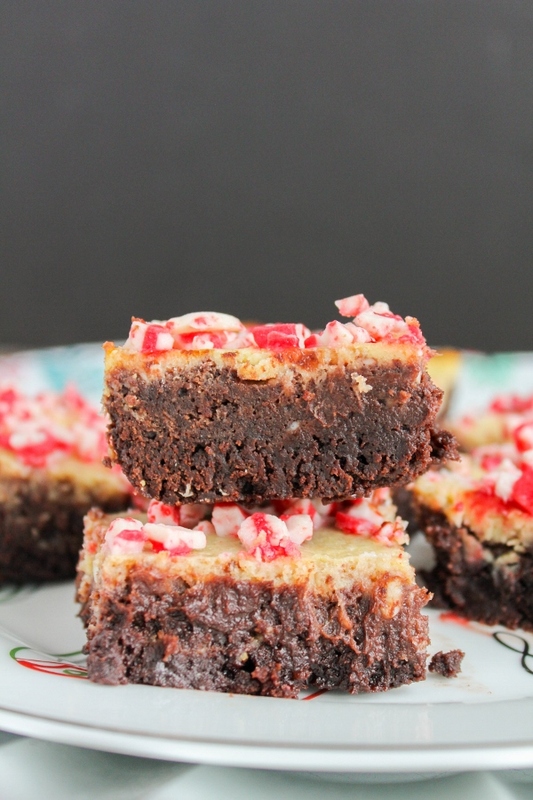 If you love chocolate and cheesecake, and peppermint too, then these brownies are for you! The dessert starts with a super thick and fudgy layer of brownies as the base. Mix up a simple peppermint infused cheesecake batter to go over the top, then top that with a sprinkling of peppermint baking pieces. The result is one simple to make, delicious and festive holiday dessert that's sure to please your friends and family. These brownies didn't last long around my house! Preheat the oven to 350 degrees. Coat an 8-inch square baking pan with non-stick baking spray and set aside. To make the cheesecake batter, place the cream cheese in the bowl of a stand mixer. Beat at medium speed until smooth and creamy. Add the sugar and peppermint extract and beat well. Add the eggs, one at a time, beating well after each addition. Add the tablespoon of flour and beat the mixture until blended. To make the brownie batter, add the flour, cocoa and salt to a medium bowl and whisk until combined. In a separate bowl, whisk together the sugar, oil, milk, eggs and vanilla until well combined. Add the wet ingredients to the dry ingredients and mix until blended. Pour the brownies batter into the prepared pan evenly. Carefully pour the cheesecake batter over the top, spreading it evenly. Carefully swirl the layers together using the tip of a knife. Bake for 20 minutes. Sprinkle the top of the brownies with the peppermint baking pieces and bake an additional 10 minutes, until the brownies are set. Cool the brownies completely in the pan on a wire rack before cutting into 16 squares. I'm honored to be a Milk Means More Ambassador and I thank them for sponsoring this post! I was compensated for developing a dairy rich holiday dessert recipe, however all opinions, as always, are my own.